Bridge building is a political act that confers considerable power to the bridge owner. I was reading in this week's New Yorker that Vladimir Putin is building a bridge across the Kerch Strait (between Russia and Crimea) to increase the Russian Federation's power over it's newly conquered peninsula. This is not the first attempt to build a bridge across the Strait of Kerch. 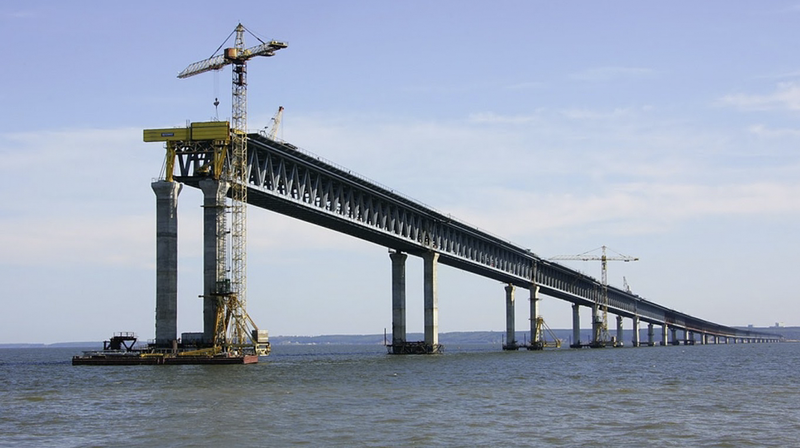 When the British Empire was still expanding, an attempt was made to build a bridge from England to India across the Strait of Kerch, but it was determined to be too expensive. Russia's first attempt to build the bridge was at the beginning of the 20th century before the revolution put an end to their plans. The Russians got another chance at the end of WWII but the bridge was soon destroyed by ice floes across the Strait. The latest attempt to build the Kerch Strait Bridge began in May of 2015. The projected budget is $4 billion (228 billion rubles). The alignment crosses Tusla Island to reduce the amount of bridge that is required (see above map). 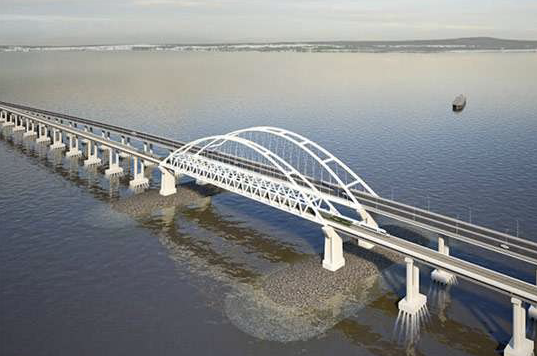 Construction of the bridge was awarded to Arkady Rotenberg's SGM Group who also built the facilities for the 2014 Sochi, Winter Olympics. That project had huge cost over-runs, which is apparently part of doing business in Russia. 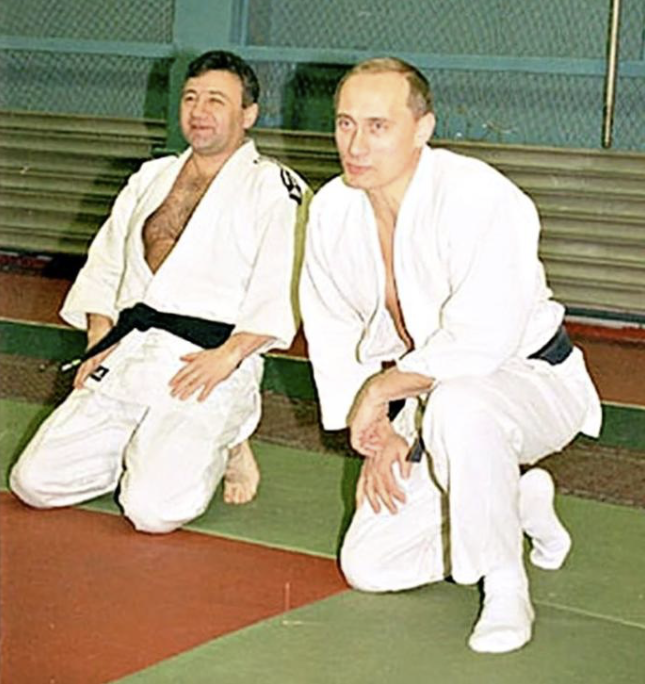 Rotenberg is Putin's childhood friend. Putin apparently only trusts his friends to run Russian industries. According to the New Yorker article, the Russian economy is a form of feudalism where all the chiefs of industry are one step away from the seat of power. Actually, it looks like two bridges are being constructed, a four lane roadway bridge and a parallel two track railway bridge. 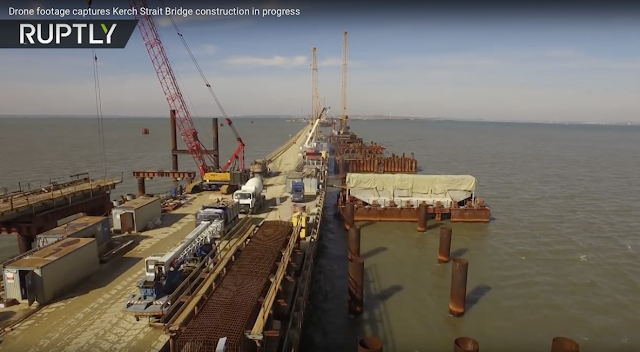 The bridges will have three segments, from Taman Peninsula to Tusla Split is 7 km, from the Split to Tusla Island is 6.5 km, and continuing to Crimea is another 5.5 km for 19 km total. Large diameter steel pipe piles were driven into the sea bed and two column bents were cast on top. Big steel truss superstructure spans were built on land, carried to their location by barge, and lifted onto the bents. What bothers me from looking at the top photo is that there are no bent caps or lateral bracing between the columns to provide lateral strength and resistance to the structure. Hopefully, they are going to be built later. 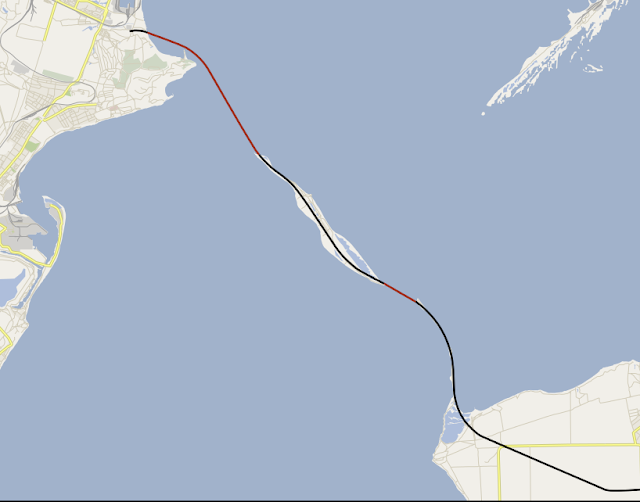 A pair of steel arch spans will eventually be built over the shipping channel, as shown in the computer generated image below. The bridge is supposed to open at the end of 2018 and be fully operational by June 2019. Trestle bridges were constructed at both ends to move material and as a base for pile driving. It was reported that 200 WWII era bombs were found while the site was being prepared for construction. The photo below (showing the pile driving off of the trestle structure) was taken with a drone operated camera by the Russian News Service, RUPTLY. Several excellent videos and other information can be found on the Internet, unfortunately mostly in Russian. There is considerable conjecture about whether the bridges will be completed on time and at cost. My feeling is that Rotenberg will do whatever it takes to keep his boss happy.